Stand by, following the usually commercial jibber-jabber for a secret message from your Minion Master! Your visit is important to us. Please give all your bank account and personal information to the nearest Minion and stare mindlessly at the screen for a end-of-summer message from your Minion Master, following the usual commercial interruptions. Minions at work is inadequately supported by your purchases from our web stores and your visits to our advertisers. Help us bleed green just a little more slowly by purchasing tee-shirts, buttons, calendars, hats, undies (we kid not! ), and other fine Minions at Work items at one of the following stores. Or check our our fine sponsors. The General Zed/No. 1 rivalry continues. What's with these guys? History, I tell you. One of these days we'll have to go into that bit of backstory. Meanwhile, it looks like there might be an unexpected trip later in the month, which means I'm going to be slamming hoping to stockpile enough cartoons so that there are no outages while I'm gone. Next week's toon is already well in process, and I'm hoping to build up a backlog. But be advised that I'll go into repeats or something for a week or two if I need to. New in stores, a great new fantasy anthology with a new story by Mrs. Minion Master, Christina F. York. 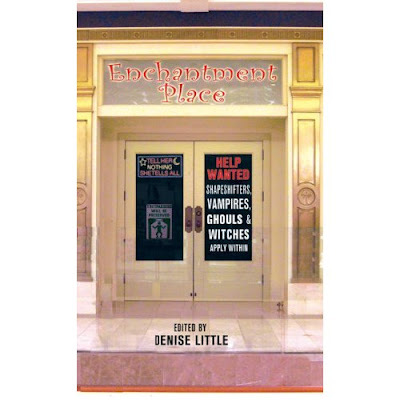 It's called "Enchantment Place," edited by Denise Little. It's 17 original stories about a magical shopping destination in Chicago where the really unusual people shop for items you can scarcely imagine. And no, we don't mean Hot Topic! Find it now at your local bookseller, or order from Amazon.